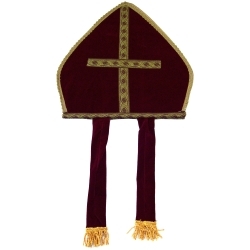 Burgundy Bishop mitre with gold embroidered cross and trim accents. The Bishop mitre hat measures 14” tall and will fit up to a head measurement of 23.5” using a elastic band for a snug and comfortable fit. The mitre is a traditional turban style hat that is worn by The Pope, Bishops, and Abbots in the Catholic Church. A common alternate spelling is miter, but both spellings are correct.